JCU researchers have found a way to predict which Barramundi parents will have the fastest growing offspring, meaning more and cheaper fish will come to market. James Cook University scientists have developed a unique process to grow barramundi faster. Researchers have been studying which barramundi parents produce the fastest growing fingerlings, in an effort to get barramundi onto the plate quicker and cheaper. Their breakthrough application, based on identifying fundamental cellular processes indicative of fast growth, will remove a significant barrier and introduce a totally new approach to breeding the popular species. 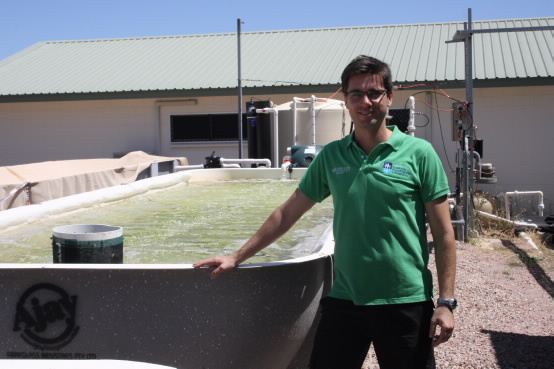 “We can now take fish larvae at 18 days old and tell the farmer which barramundi offspring from which parents will grow the quickest,” said Dr Jose Domingos from JCU’s Centre for Tropical Sustainable Fisheries and Aquaculture (CTSFA) in Townsville. Dr Domingos said researchers used genetic techniques to look at the ratio of RNA (an indicator of cell growth) and DNA in the barramundi babies. “We have shown that offspring with the highest RNA:DNA ratio will have the fastest long term growth to harvest size,” he said. At present farmers must wait until offspring are harvested at about 18 months old to determine which parents produce the fastest growing offspring. This means they need to keep large numbers of brood stock on hand, which is an expensive process. The JCU team’s work, funded by the Australian Research Council's Industry Linkage program with partner Mainstream Aquaculture, will help barramundi hatcheries and farmers reduce costs and increase production. In Queensland, barramundi is the fastest growing aquaculture sector, with more of this fish now coming from farms than is caught in the wild. The importance of the industry is increasing as the global population rises and with it the demand for protein sources.